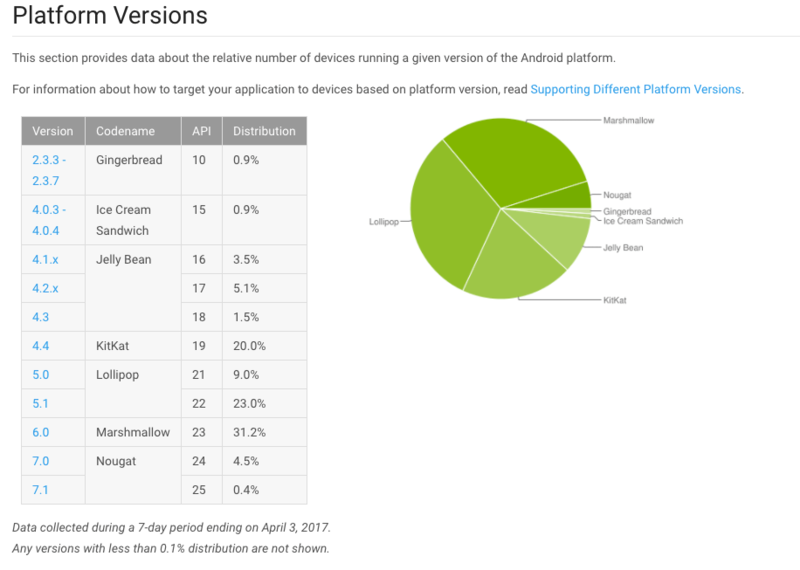 Following up on the near doubling of the number of installed device, Android Nougat has once again made big gains this month according to the latest Android Distribution Report. The report, published today, reflects the versions of Android that hit the Google Play Store between March 27-April 3 and it saw the latest build of the platform hit a 4.9% install base. That is up 2.1% over the March report and, while still low, shows that Nougat is making steady inroads. Many manufactures have released their Nougat updates for their devices so it is likely that this number will continue to increase at a reasonable clip over the course of the next several months. Perhaps more telling, every other version of Android fell in install base when you compare the March and April reports. Android Marshmallow saw a drop of .1% while Lollipop took the biggest hit with a drop of 2.5%. Android KitKat fell by .8%, Jellybean by .5% and both Ice Cream Sandwich and Gingerbread fell by .1%. The later to builds now sit at just .9% of the install base and this could well be the last time we see them on this report. manufactures to get updates out, going as far as to report in their security reports which manufactures are doing a better job than others. This is good to see and as Nougat and Android O will likely benefit from this push from Mountain View. As for ClintonFitch.com, as is always the case, the numbers are a bit different for those of you who visit the site from your Android devices. Looking at the same time frame for those who visited the site from Android devices, Lollipop led the way with 37.21% of visitors while Nougat came in second at 36.62%. The drop off from that point is significant with Lollipop coming in a distant third at 15.15%. KitKat was responsible for 5.11% of Android traffic to the site while Jelly Bean came in at 2.16%. Ice Cream Sandwich was at .59% while Gingerbread rounding things out at just .2%. All told, Android accounted for just over 74% of all mobile traffic to the site.